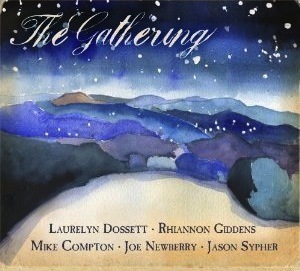 Last month, right after Thanksgiving, the North Carolina Symphony gave the premier performance of “The Gathering: A Winter’s Tale In Six Songs,” a work the Symphony had commissioned from Polecat Creek’s Laurelyn Dossett. 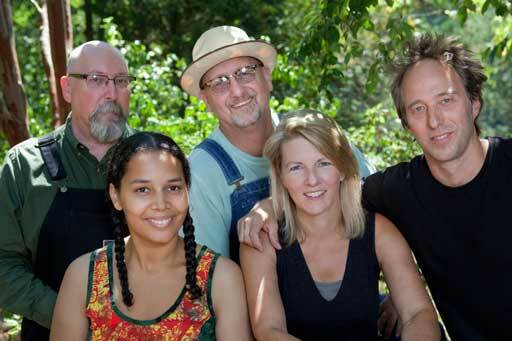 The musicians Ms. Dossett enlisted to assist her included Rhiannon Giddens of the Carolina Chocolate Crops; the John Hartford and Nashville Bluegrass Bands’ Mike Compton; multi-instrumentalist Joe Newberry; and double-bassist Jason Sypher. It was a hot week in August when the musicians assembled to record Ms. Dossett’s composition and bolster it with seven other new and vintage seasonal tunes to make an entire album of The Gathering. It has a certain magic about it, this music, in the seeming ease of its instrumental virtuosity coupled to a spirit of friendship and common cause—there is not a moment on The Gathering that doesn’t sound free and impassioned, musicians having a great time playing with each other and giving their hearts to the task at hand. The album’s centerpiece is the commissioned work, in six parts, focusing on a prodigal daughter’s return home on a cold winter night. “Light a candle in the window/for the night is gathering there,” the gals sing in unison over the rumble of Sypher’s bass in the first words we hear on the first of the six songs, “Gathering Night”; continuing the story, they remark on the night’s guardianship of the land it envelops, parting as it does only for the candle’s light, “the light that leads a traveler home.” Ths spare, evocative opening leads into “Lights In the Lowlands,” a gentle but plaintive missive from the daughter who “left without blessing or grace” and is “returning with nothing to show.” Her worries are countered by assurances from the mother (sung by Gidden) and father (unidentified) that she will be embraced anew “should you follow the lowland light home,” until the voices are overlapping in the mellow, mandolin-flecked (by Compton) arrangement; at last everything falls away and leaves Dossett to wonder, “will my father still know me/will my mother still remember me/should I follow the lowland light home?” The ensuing "Redbird," fueled by banjo and fiddle (Newberry and Giddens, respectively), is a jubilant anticipation of the homecoming at hand, replete with preparations for a feast and dad’s anxiousness as he studies the landscap, searching for a familiar figure (“poppa, what’s your worry/who’s that you’re looking for” sing the “kids”), in a high stepping tune that takes us right through the day until it’s time to for the kids to go to bed, which allows Giddens to draw matters to a close with a spirited fiddle solo of the sort she’s mastered in the Chocolate Drops. 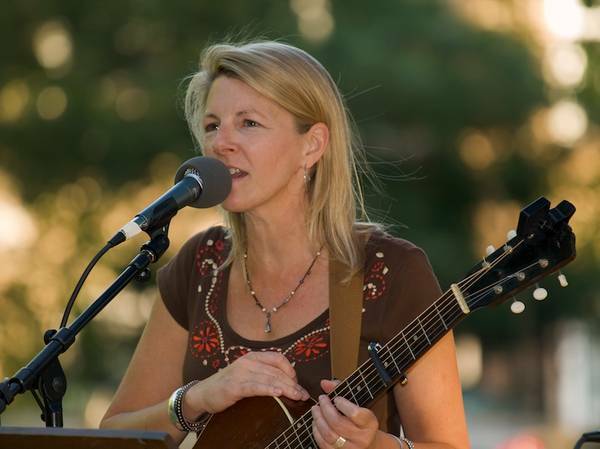 Here the story takes an introspective turn, first into the tender “Redbird Lullaby,” now referencing the previous song’s redbird as signaling the end of day, with Dossett’s soothing vocal supported by a sighing background chorus and Newberry’s soft strummed mandolin. A bit more energized but reflective still, “String of Pearls” finds mother, son and daughter acknowledging their blood ties and concluding on a note of “a stranger on a winter’s night”’s impending reconciliation as she spots the “distant candle, the stars aswirl/moon after moon/on a string of pearls,” a beautiful passage sung with firm conviction over a steady, rustic backdrop of mandolin and guitar. All of which proves an ideal setup for the concluding “Diamonds In the Pines,” a romping, celebratory sprint with the ladies’ voices intertwined and circling each other in jubilation, home at last, and safe, with everything in the world in its place, shining “like diamonds in the pines,” as the fiddle, banjo and mandolin break into a hallelujah sprint that will have you cheering inwardly at the sheer joy exuded by voices and instruments alike. It’s about 20 minutes all told, this “Gathering,” but packed with deep feeling on every level, making its point without belaboring it and resonating mightily as a tale for all seasons, not simply this year's. The disc is filled out with similarly affecting performances. Newberry’s “This Christmas Day” is a warm-hearted, tenderly rendered exultation celebrating the day’s animating event, whereas his “First Day of the Year” takes a similar path in being a gently swaying reflection on the “joy and sorrow” we gather en route to celebrating another go-‘round “with kith and kin,” although its last minute or so breaks into a joyous, strutting, banjo-driven workout. Of the traditional fare, a deeply invested Giddens honors the wondrous event detailed in “O Holy Night”; Dossett leads a plaintive a cappella reading of “I Wonder As I Wander”; and the ensemble brings things to a backwoods, shambling close with Giddens's soulful vocal leading the way on the traditional Christmas spiritual, “Christ was Born On Christmas Morn.” If these folks are never to reassemble, if this is to be the only Gathering, let it be said they kept Christmas well in giving the rest of us pause to consider anew the invaluable blessing of family, truly a gift that keeps on giving.